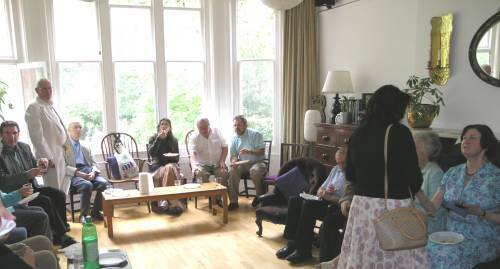 On the first Sunday in August 2008, members of the Hampstead Scientific Society gathered for a summer party, hosted by Simon Lang, and a tribute to their departing President and Council members. Prof. Robert Weale (left) has stepped down after 20 years of ably steering the Society. 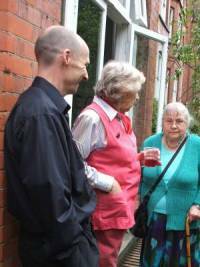 His wife Betty (left) served coffee and tea after our talks for most of that period. Elisabeth Fischer (on the right in blue) served as Membership Secretary for 30 years. Also after 30 years, but as Secretary and Treasurer, Peter Wallis (standing by the window) was persuaded to stay on for another year and hand over gradually to John Tennant. The incoming President Doug Daniels paid tribute to the retiring officers. 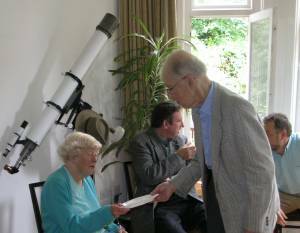 Then Terry pearce paid tribute to both Doug and Julia Daniels' long service to the Astronomy Section. 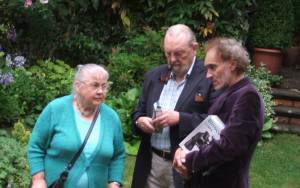 Below they are enjoying a look around the garden between showers. Our host Simon chatted with the Daniels and Alison Bolton on the decking outside. 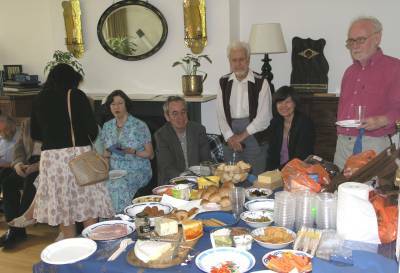 Meanwhile members look with admiration and anticipation at the spread he prepared with Michael Wynne.